If you're an author then you know how challenging it can be to reach out to a new audience and spread awareness about your book. We know that promoting a book can eat up countless of valuable writing hours, so we're here to help reduce the burden of promotion so you can spend more time focusing on what matters most: writing. Gleam has a suite of apps which can help you promote your book and grow your following in highly effective and less time-consuming ways. 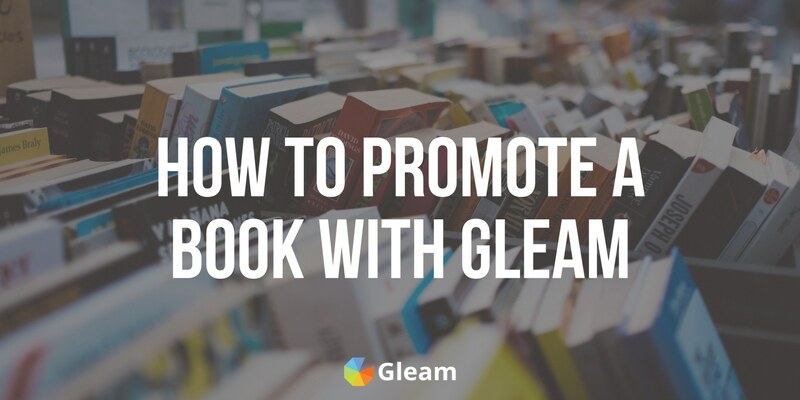 In this guide we'll show you exactly how you can use Gleam's apps to promote your book and reach out to new audiences. These promotional strategies are designed to work for writers of any level, so whether you're an indie writer or a well-established author we'll have something for you. Here at Gleam we're big fans of using contests and giveaways to drive growth. We've seen many of our own customers successfully grow their user base with contest marketing and the same can be true for you. You can use Gleam's Competitions app to grow your following, drive real user engagement and connect with an audience who isn't familiar with you or your works. It's an affordable way to encourage actions across multiple platforms, grow your audience, and ultimately drive sales. Giving away copies of your own book is a great way to drive engagement from a highly relevant audience and generate awareness amongst potential customers. Making your own book the prize of your giveaway will guarantee that your participant pool matches exactly with your target market. After all, the participants are interested in winning your book! This means that your Competition will drive action from highly relevant users and fill your mailing list and social media channels with people who would like to read your books. This puts you in an outstanding position to engage with an interested audience and generate more leads post-campaign. Competitions allows entrants to sign up for your mailing list, interact with your social media pages, visit your book's landing page or even read an excerpt from a book. These are all brilliant ways to promote your book and build lasting relationships with relevant users who are interested in your writing. Who knows, they may be interested in your future works too! Don't have a website? Gleam automatically hosts your Competition with a unique link you can share with your entrants. Reading accessories such as book lights, bookmarks, tea, mugs or scented candles. Writing accessories such as pens, pencils, notebooks and diaries. A selection of short stories that you've written. A bundle of your other books. A hand-picked selection of your own favourite books. Bonus content such as planning documents, mood boards, drafts or unpublished writing. Gift cards to relevant outlets such as Amazon, Barnes & Noble or Starbucks. These prizes can work on their own or as a part of a bundle. It all depends on how much you want to give, and how many winners you want to select. These gift ideas work great for attracting a large pool of avid readers, however entrants are obviously not going to be as highly targeted as when you set your own book as a prize. This means you need to be prepared for an audience who may be unfamiliar with your writing. At a glance, this less targetted audience may seem like a disadvantage to your campaign, but the truth is you have the perfect opportunity to expose yourself and your writing to a bunch of new readers who may otherwise have never given your book much consideration. Offering a prize that is appealing to readers in general is a fantastic way to gain the attention of potential customers, so incentivise actions which will promote your book and generate valuable leads. Getting participants to visit your website, check out your social media activity, follow you on Goodreads or read excerpts from your book are all great ways to introduce yourself and your writing to potential fans and lay the groundwork for a prosperous reader-writer relationship. 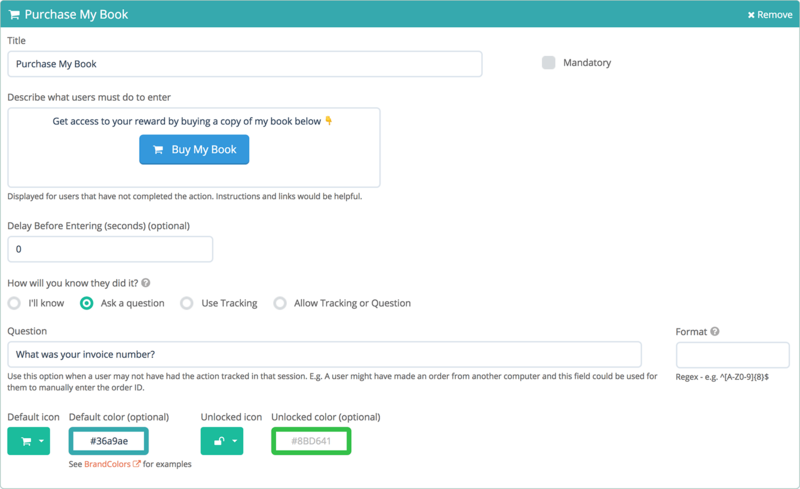 If you want users to read book excerpts, you'll need to set up a dedicated website containing your writing which you can direct users to using Gleam's Visit Action. These types of giveaways aren't only great for extending your reach and growing your audience. They can also be a terrific way to reward fans who have read your book. This will strengthen your relationship with your audience and help build a loyal fan-base which will significantly aid the success of your future promotional efforts. As an author, book reviews are one of the most important factors for reader acquisition. So asking users to leave a review on your book as an entry action is a great way to gain valuable promotional resources and also reward your readers by giving them a chance to earn extra entries. You can easily collect reviews as entries using Gleam's Submit URL Action. You can even set URL parameters to ensure that users are submitting reviews from a platform of your choice. If you maintain an active presence on Goodreads then it's a terrific idea to use your competition to incentive follows on the platform and increase your fanbase. Goodreads is a terrific platform for promoting your books, interacting with fans and encouraging reviews. So using your campaign to bolster your presence on the platform is always a good idea. Another way you can reward your readers with extra entries is by using the highly engaging Secret Code Action. With our Coupon action you can offer discount codes from within your giveaway. This is a great way to offer participants a discount on your books which can help drive sales. Using the information we've provided you so far you should be able to set up some powerful campaigns that will drive a lot of user engagement, but before you get started setting up your own Competition there are a few more things to consider. Gleam Competitions' Post Entry Redirect feature allows you to automatically redirect the entrant once they have successfully completed the Competition entry actions. Encourage users to complete every action by offering some special bonus material as incentive. Drive sales by sending users to an online store where they can purchase your book. Reward users and promote your work by giving entrants access to a free chapter of your book. 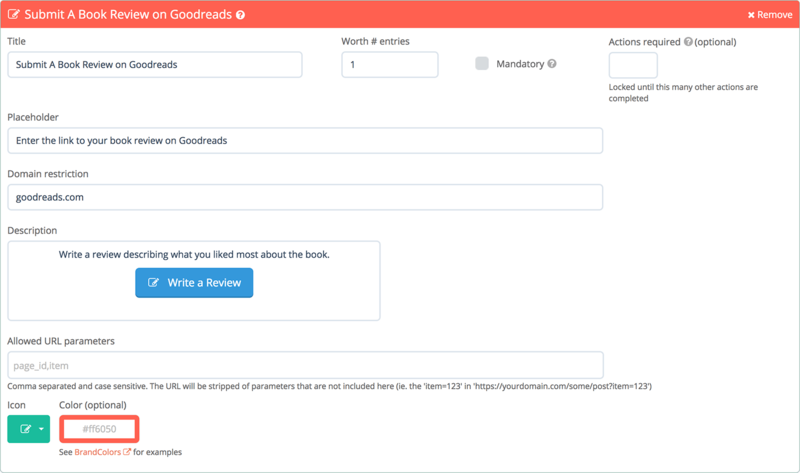 Redirect entrants to your Goodreads review page. Having a mailing list handy will help you with your future promotional efforts, so start growing it as early as possible! Gleam makes collecting emails from Competitions a breeze. You can use the Competitions user details form which gives you the option of making email signup mandatory for entry. You can also incentivise email signups by awarding additional entries to users who sign up to your mailing list using our Subscribe action. Once your Competition is over you're likely to have a lot of new email subscribers and social media followers. If you want to convert these users into customers then you'll need to start engaging them immediately. One way of doing this is by sharing entertaining and informative content with them. Excerpts from your book, short stories or behind the scenes content are all great ways for you to engage with your new subscribers. Check out our documentation on setting up your own Competition or start using giveaways to promote your book now! Using Coupons to offer a discount on your book is an outstanding way to encourage immediate sales and drive a variety of other actions. With Gleam's Rewards app running a campaign like this has never been easier. Try using Rewards to encourage users to sign up for your mailing list, follow you on social media or even leave a review on a previous book. This will make it a lot easier to promote your present and future works as you'll have an existing audience ready to tap into. In addition to enhancing your long-term promotional efforts, you can also use a discounted offering to help drive social sharing and reach new audiences. You can get users seeking a reward to send out a tweet promoting your book or Rewards campaign, retweet one of your own posts, or drive Facebook engagement by viewing your page or a particular post. These are all great ways to gain exposure from new audiences and promote your book to a wide array of potential customers. You cannot incentivise Facebook likes, but a lot of users who view your post will like anyway. Just make sure your content is engaging and you should have no trouble generating likes. Something else to keep in mind is that it's completely up to you how many actions a user must complete before they can claim a reward. You want to find the sweet spot where you're driving enough meaningful actions without making the barriers to entry too high. You don't want anyone to give up on your reward, but you probably don't want to give discounts to people for just viewing your Facebook page. If you've written other books in the past then using Coupons to offer a discount on your latest writing can be an outstanding way to incentivise the purchase of previous books (or visa versa). This is particularly effective if you're writing a series of books, as users who are interested in one iteration are highly likely to be interested in the whole series. If you take this approach then you should keep in mind that you're essentially selling two books at once. Some users may be hesitant to commit to two books, especially if they're unfamiliar with your work, so offering a larger discount in this scenario can greatly help you encourage action. Relying on a discounted offering to drive sales may seem like a drawback as it will initially reduce your profit margin, but you have to remember that a campaign like this works best as a way to kick-start your initial sales. The first customers are the hardest to find, and offering a discount with a Rewards campaign is a highly effective way to encourage early sales whilst also driving meaningful actions. Once people start reading and enjoying your book word-of-mouth will start to play a major role in your sales and you will be able to rely less and less on discounts both now and in the future. Check out our documentation on running your own Rewards campaign or start offering discounts now! Email marketing remains one of the most powerful promotional tools you have at your disposal. Email is arguably the best way to keep your audience up to date with all your activity including promotional campaigns and upcoming releases. However, if you want your email marketing to be a success, you need a mailing list. You can use Capture to offer your readers an incentive to sign up to your mailing list (and buy a copy of your book). We recommend showing an offer like this to new visitors on your site. It's a great way entice a purchase and encourage email signups. If your book is only for sale in specific countries, you can also restrict the pop-up to show in pre-defined countries only. Simply enter the name of the countries you would like to include in the Geo-location behavioural rule. 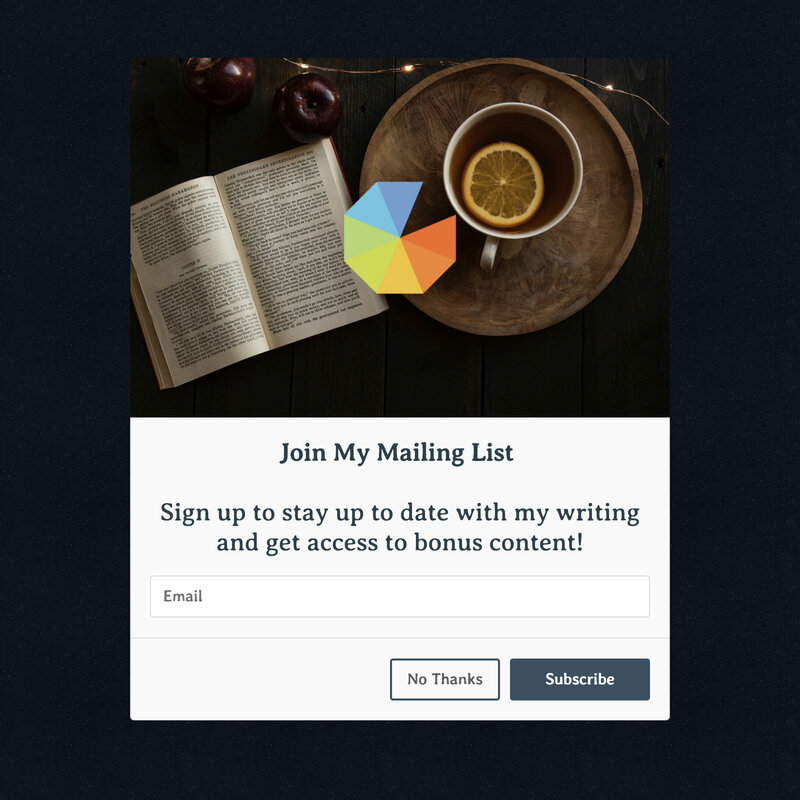 If people like what you do and want to stay up to date with your writing then timely updates and interesting content can be enough motivation for a lot of people to sign up to your mailing list. Gleam has a wide variety of Capture Templates you can use to drive signups ranging from subtle and unobtrusive to bold and attention-grabbing. So whatever approach you want to take to driving email signups Capture has you covered. 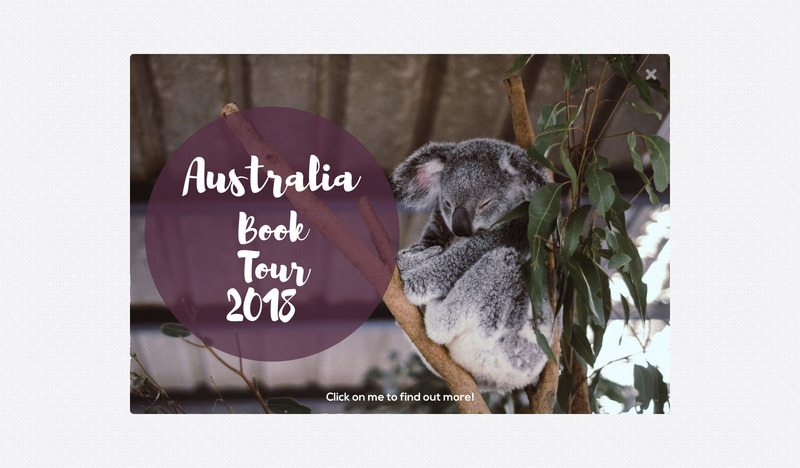 Are you on a book tour? Using our custom rules, you can create highly targeted messages for your website visitors. For example, if you're touring Australia on specific dates, you can setup a Capture to run months before the actual tour so Australian users who visit your website will know exactly where you're going, and when you'll be there. Ready to Start Collecting Emails? 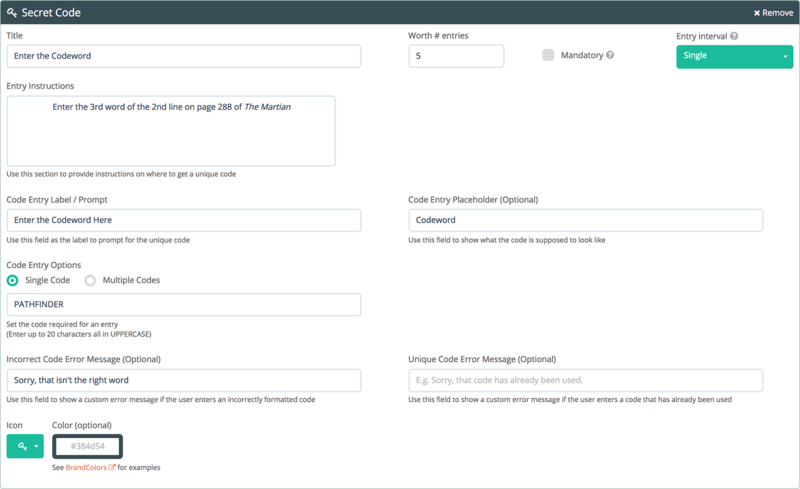 Check out our documentation on setting up your own Capture or start growing your mailing list now! 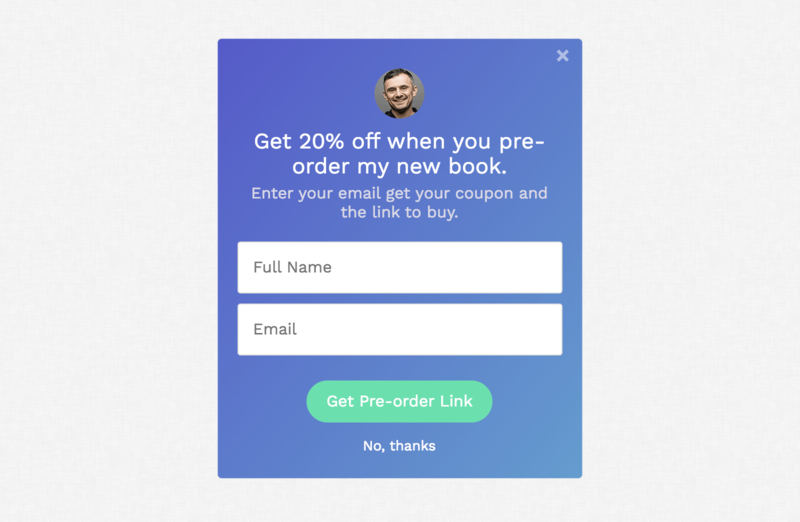 If you're publishing a book soon, a pre-order campaign can be a great way to gain early traction and generate buzz for your book before it's even released. Opt to run the campaign 3-6 months before the book's release date to start generating leads (and make some pre-sales) so you can take some pressure off the official launch and make the most of your pre-launch mailing list. So how do you run a pre-order campaign for your book? Gleam Competitions can easily help you manage email collection, encourage audience-driven promotion and generate a lot of interest before the official launch. There are a few different ways you can run a pre-order campaign. You can either incentivise pre-order sales with Rewards, or you can run a giveaway to drive social actions. We've already covered both these tactics, and all the same principles apply to a pre-order campaign. If you're an indie author publishing for the first time, you may also want to consider pairing the event with a giveaway to gain extra attention and provide users with a little extra incentive to attend. It can be as simple as giving away some free books to a given number of attendees. Want to make your event extra engaging? You can get creative here and pair the reading with other activities related to your book. For example, if you've written a book about skincare, consider running a simple workshop or a skincare 101 seminar to attract your target audience. If you like the idea of Running a Giveaway then you may want to incorporate one into your event with Competitions' Event mode feature which allows you to run your giveaway during a live event. Event mode allows you to collect multiple entries on the same device so you can easily get your attendees to enter from a tablet you provide. Running a Competition at a live event is a highly effective and engaging way to incentivise email signups. You don't want people at your event spending too much time signing in and out of various social media accounts, so if you're running the Competition from your own device it's a good idea to limit entry actions to email signups. Once a book has started to gain traction and pick up momentum a huge amount of sales come from word-of-mouth recommendations, but a major challenge that all authors face is driving those initial sales and picking up some velocity. So the big question is, how can you promote your book, drive early sales and kickstart your growth? Well, there may be no simpler or more effective way to do this than by giving users some extra incentive to make a purchase. You can easily do this by running a Rewards campaign with Gleam. 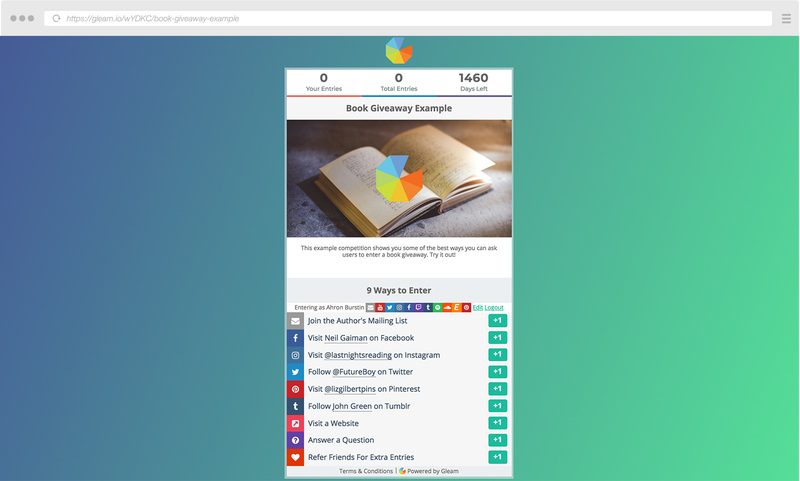 Using Gleam's Rewards app you can easily set up a campaign which will provide users with an instant reward for buying a copy of your book. This is a fantastic way to capture attention and give your audience a little extra motivation to make a purchase. You can easily set up your own Rewards campaign to incentivise sales using Gleam's Custom Actions. A collection of short stories that you've written. A second copy of the book to give to a friend. A copy of another book you've written. Reading accessories such as book lights, bookmarks or scented candles. Rewarding users with bonus content is easy with Gleam's Redirect feature, as it allows you to instantly send users to bonus content once they have completed the required actions. If you decide to run this type of Rewards campaign (or the Discounted Offer Rewards Campaign we discussed earlier) then you should be using the campaign as another great opportunity to collect email addresses with user details forms and using your new contacts to drive future promotional efforts. Once you've figured out exactly how you're going to reward your customers you'll be ready to start enticing users and driving sales. Check out our documentation on setting up your own Rewards campaign or start driving sales now! Can I Ask Users to Purchase My Book to Enter a Giveaway? This is a bit of a tricky one as it all comes down to where you're running your giveaway. The U.S.A.'s No Purchase Necessary Laws mean that no giveaway or sweepstakes run in the U.S.A. can require users to make a purchase in order to enter. Many countries around the world also have similar laws which deem this sort of giveaway impermissible, but this is not always the case. For example, in Australia you can ask users to purchase a product as a competition entry requirement, though permits are often required. If you do want to ask users to purchase your book to enter a giveaway, it's vital that you always remember to check your local laws to see if permits are required and if any No Purchase Necessary laws will affect you. Want to know more about running a regulation-compliant campaign? Check out our Complete Guide to No Purchase Necessary Laws to learn more. If you are lucky enough to able to run a purchase based competition then it can be a great way to directly incentivise book sales. Once again, Gleam makes running this type of campaign a breeze with our Competitions app. This type of campaign works very similarly to the Rewards campaign except instead of using a small gift to encourage purchase you will use the chance of winning a larger gift to drive sales. Setting up a Competition like this demo is quick and simple. You just need to use the same Custom Actions setup which we demonstrated for the Rewards campaign. If you decide to run this type of Competition you need to remember that a giveaway where entrants need to spend money on a book has a reasonably high barrier to entry, so you need to make sure the prize justifies the effort. You'll want to give away something valuable like a big bundle of reading accessories, a collection of books and short stories or a valuable gift card to Amazon or Barnes & Noble. You want the prize to be valuable, but you also want it to be highly targeted towards people who are likely to purchase and enjoy your book. If you write YA fiction you want your prizes to appeal to young adults. The more geared towards your target demographic your campaign is, the more likely it is to succeed.